So much news! So much news! 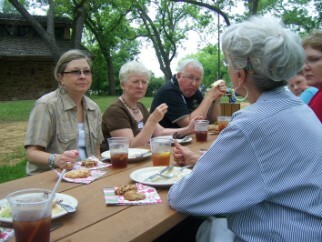 Six members of the Hill Country Women of Words met on Monday night, May 17th. Our small number allowed us to relax and expand and even get home before the night’s storm hit. Linda Colie says she may not be moving until August, so we will plan to meet at Highland Oaks in June. Linda brought us a macabre untitled little tale about old, arthritic Deckland, his son Vernon, and Deckland’s fiancée, Gracie. Linda asked us to help her with the title, so we suggested, “What My Father Dug Up.” Let’s just say the ending has a definite Twlight Zone feel to it! You will be sorry that you missed this story from Linda. Email and ask her to send it to you at llcolie@gmail.com. Her writing versatility is amazing! Sally Clark brought five poems she submitted to Robert Lee Brewer’s April Poem-a-Day challenge entitled, “Partly Married,” “Getting Ready for Work,” “The Last Woman I Saw Wearing Curlers in Public,” “At Thirteen,” and “Gym Class.” I also brought three poems I submitted to the Abilene Writers Guild monthly contest on the theme of School Daze: “Fast Learners,” “Quick Silver,” and “Fish School” and one poem-in-progress I call, “The Widow’s Mite.” I also brought along the article that Bambi Haley asked me to write for the Johnson City Record Courier that I titled, “Writer’s Batteries Re-charged at Local Writer’s Event.” That was a new experience for me but I requested quotes from the writers who were there and the article practically wrote itself! to June 15th and we are now accepting short essays of up to 500 words. See www.fredericksburgpoems.yolasite.com for more details. Dena Dyer was at the meeting with good news and bad news. You should have gotten an email by now about her first good news – Dena is offering two writing classes through Community Ed in July – one on how to write book proposals and another on social networking (Twitter, Facebook, blogs, etc) which is also a great course for anybody who wants to sell over the web. And they’re only $25 each!! Check out the details in the Community Ed flyer that came in the mail or email me. Dena’s other good news is that she’s having a book signing at The Closer Walk on June 5 at 10:00 for her newest book from Barbour House Books, Let The Laugh Lines and Wrinkles Come! I will send out more information about the book signing next week. And now for Dena’s sad news, well, sad for us. She and Cary are moving to Amarillo on July 20, the day after our July WOW meeting (which will also be a celebration of our 9th anniversary as a group). Cary is longing to make a career change and become a Speech Pathologist, specializing in helping vocal performers. I bet he will be wonderful at that considering his experience on the stage. They chose Amarillo because the university there had a Speech Pathology program and because it is only one hour away from Dena’s parent’s ranch and her brother and sister-in-law live in Amarillo. “We’ve never lived this close to family,” Dena says and she is very excited and happy but very sad to be leaving us. I told her, “You will have to start your own WOW group in Amarillo” and I hope she will. Thank goodness for email - Dena will always be a part of our group! Dena has another goal in Amarillo, too – she would love to get her MFA in Creative Writing and teach at the college level! I hope all her dreams come true and wish her every blessing. She certainly has been a blessing to us. 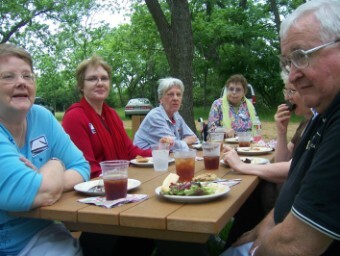 Seven WOW members attended the Johnson City Writer’s Event – Cindy Harper, Alice Kolb, Sally Clark, Liz Eberle, Sheila Kale, Sheila Barnette (and her husband, George), and Linda Colie. We had a wonderful time, were very well fed, and were totally inspired!!! I will send out a copy of my article as soon as it is published. There will be another <?<span>Johnson City event in January, so make plans to attend now! Aimee Martin sold a story to Extraordinary Answers to Prayer: In Time of Need. It should be out soon. I hope you had a chance to read her story attached to the email I sent out. It is chilling. Aimee is coming most Tuesdays to the TWiG group. Cindy Harper says, “Please tell everyone, until I end my two-day-a-week tenure working at a Chase branch in New Braunfels to help them thru a time of transition, I won't be able to make many WOW Mondays. (Monday is one of my NB days.) That will probably end within a month, so I should be back soon. Sorry to miss everyone!” Cindy has written one new devotional since the writer’s event and sent it out on email. I hope you all got one. If not and you’d like to read it, drop Cindy an email at cindyharper@austin.rr.com and ask her. 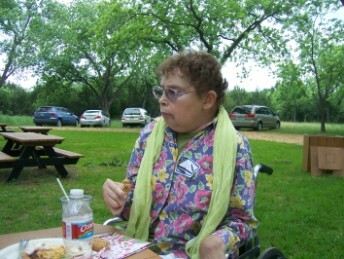 Sheila Kale was in San Antonio, celebrating a granddaughter’s birthday with her husband, Steven. Rebecca McCright hopes she can make it next month, but I know she will be very busy getting ready for her teachers retreat in July. Watch your emails for more information about this event. And Kathleen Maxwell sent her regrets that she could not attend. For those of you who remember Karen Eby, a wonderful Christian writer from Medina, TX, she and Sandy Reitz are planning a retreat called “Thirsty Women’s Gathering” at The Haven River Inn in Comfort, TX, July 27th and 28th. I’ll be sending out an email about this event soon. There are no June birthdays that I am aware of….please let me know if I have overlooked anybody!! !